Last night was my monthly "Dear Jane" class. For those unfamiliar with "Dear Jane," it's a quilt from 1863 that was made by Jane A. Blakely Stickle. 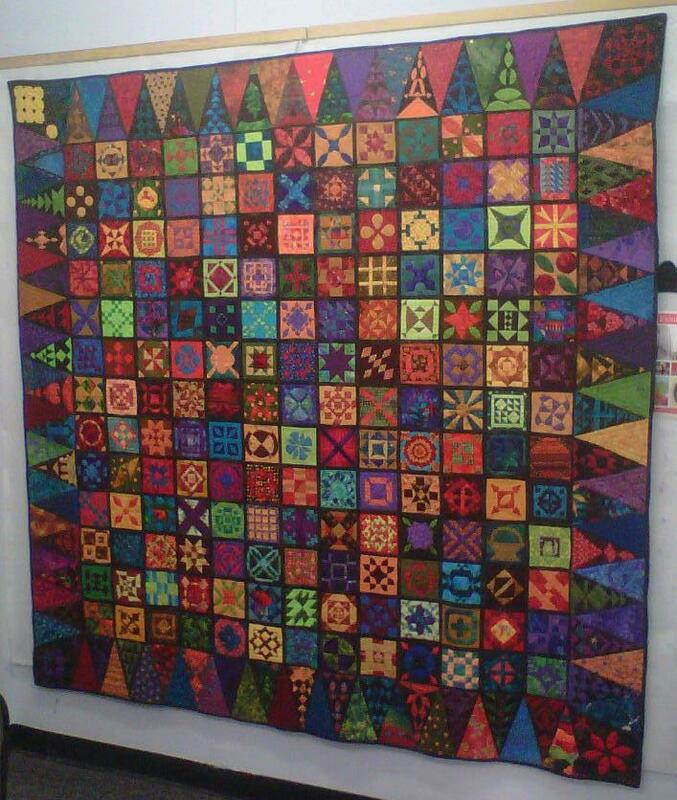 It is made up of 169 unique 4.5" blocks, 52 pieced triangles, four corner "kites," and 56 solid triangles. 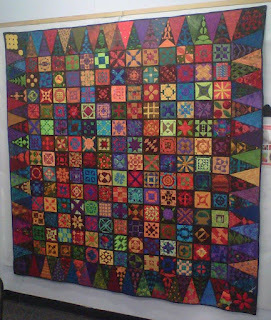 It gets its name from a book by Brenda Manges Papadakis, in which she imagined writing letters about the quilt to Jane Stickle, hence "Dear Jane..." She drafted patterns for each of the blocks, triangles and kites, and she gave names to each of the blocks (e.g., Maze of Madness and Bennington Star). Here's the completed Dear Jane quilt that hangs at the front of the room for each class. It was made by the teachers, Judy Doenias and Diane Rode Schneck. 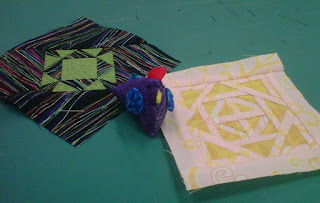 Each session, Diane chooses a couple of blocks and one triangle as challenge blocks. Anyone who completes one (or several) is eligible to win a little chicken pin cushion. I finished both challenge blocks this session (they were both foundation pieced, which I love doing), so I won a little purple chicken! Great job finishing your adorable blocks and congrats on the prize! :) Found you through Marcia's new blogger linky!